On 11-25-03, at approximately 2000 hours, I was contacted by Dep. D. WOLFE of the MORONGO Basin Sheriff's Station. Dep. WOLFE told me the following. Dep. WOLFE told me he had recently been at a location investigating a landlord tenant dispute in Morongo Valley. Dep. WOLFE told me while at the location he contacted the reporting party and involved party in the landlord tenant dispute. WOLFE told me during the contact with the tenant he was invited inside the apartment. Dep. WOLFE told me while inside the apartment he observbed green leafy plants in a closet area near the living room. He told me he was also told by the tenant, later identified as, Jeffrey CANADA that he was growing medical marijuana. CANADA produced some documentation showing a doctor's authorizaiton to grow medical marijuana. Dep. WOLFE told me because of radio traffic and radio communication in the area he was at he was not able to contact the Watch Commander to confirm if the county was recognizing medical marijuana certificates. Dep. 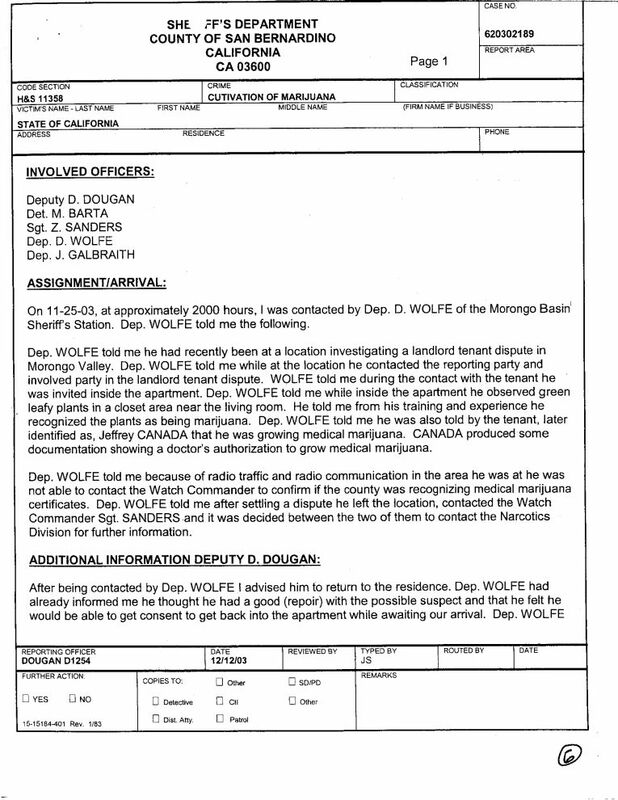 WOLFE told me after settling a dispute he left the location, contacted the Watch Commander Sgt. SANDERS and it was decided between the two of them to contact the Narcotics Division for further information.